Jared Hanson scored with 40 seconds left in overtime to give MHW an important 5-4 Eastern A victory over Waterville. WATERVILLE — Dan Condon and Matt Plourde cycled the puck behind the Waterville net as the final seconds of overtime ticked away at Alfond Arena on Thursday evening. The top-line forwards for the Maranacook/Hall-Dale/Winthrop co-operative hockey team waited for someone, anyone, to shed a defender and get open in front. Hanson scored with 40 seconds left in overtime to give MHW an important 5-4 Eastern A victory over Waterville. The goal capped an incredible comeback for the Hawks (3-2-1), who rallied from 3-0 and 4-1 deficits. The game-winner came with the Hawks on the power play after Waterville forward Dalton Denis was whistled for a five-minute boarding major. Condon, who had a goal and an assist to give him a team-high 19 points this season, set up the goal when he fed Plourde the puck behind the net. 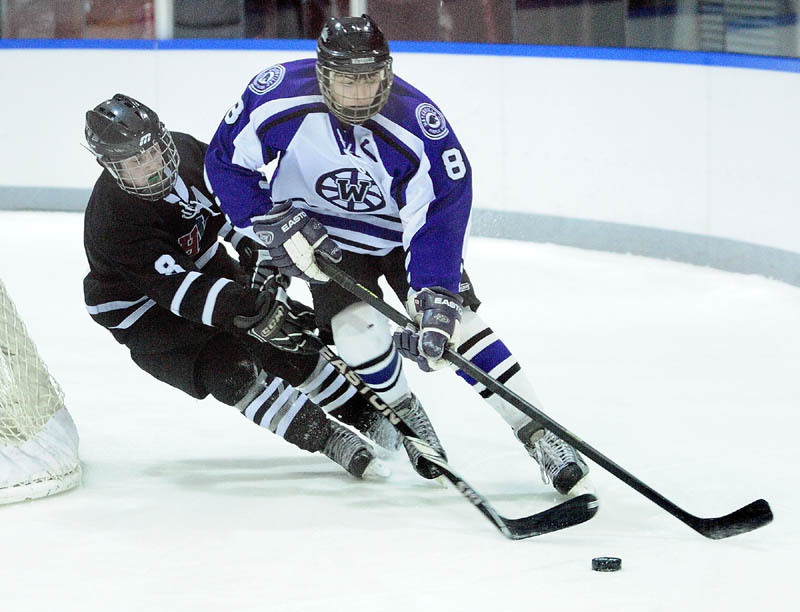 Plourde then fed the puck out front to Hanson, who beat Waterville goalie Kaleb Kane cleanly. Plourde had a goal and three assists. He set up the game-tying goal, too, which Condon scored just 1:39 into the third period. Bailey Clark and Nick Lacasse also scored for the Hawks, who halted a two-game losing streak. Three of their goals came on the power play. Tyler Plante stopped all 10 shots he faced to earn the victory in relief of starter Joshua Ehirobo. Samson scored two goals for the Purple Panthers (2-5-0). The Panthers led 2-0 after the first period and extended the lead just 53 seconds into the second when Chris Lee came streaking down the right side and beat Ehirobo with a low shot to the glove side. Bailey Clark finally helped MHW break through when he scored a power-play goal about four minutes into the second. But again the Panthers responded, this time on a Samson goal six minutes into the second period to push the lead to 4-1. But Waterville couldn’t put away the Hawks, who took advantage of a few power-play opportunities to claw back into the game. Plourde and Lacasse scored in the final six minutes of the second period to help the Hawks pull within 4-3. Condon then tied it early in the third when he beat Kane with a hard wrist shot from the right circle.